If you want a good sized storage shed that focuses on quality and security, this is a great model to consider. 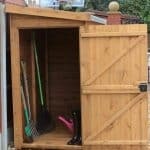 It can be used as a small workshop or hobby room, as well as a storage facility thanks to its 12mm tongue and groove construction. One of the things we like about this building is that it isn’t just the walls that benefit from the thick 12mm cladding. The floor and the roof have also been constructed with the same strength materials which drastically improves its usage capabilities. It is also great for those looking for a private place to store their equipment. It doesn’t have any windows so everything you store will be kept fully away from prying eyes. Security is clearly a top priority here, as the solid doors come fitted with a Rim lock. This is a good quality lock which ensures you are the only person with access into the building. The cladding is also sturdy and hard to get through. A feature we’re always happy to see is the apex roof. Now with this shed, Waltons have focused on giving it an extra-tall height. Not only is the roof taller than average, but the eaves are extra tall too. So you benefit from taller storage space, as well as a more comfortable building to walk around. Its unpainted finish may be off-putting. However, Waltons do provide a free Golden brown treatment which can solve this problem. This is one of the higher quality wooden storage sheds provided by Waltons and it comes packed with longevity benefits. Thanks to its strong tongue and groove construction, it has the ability to also be used as a small workshop. The Premier Groundsman collection is built to last and you can really tell the difference in quality – even on the inside of the building. 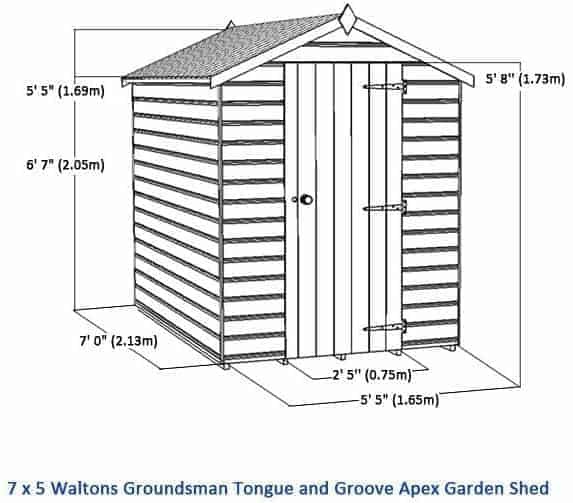 These measurements are pretty standard with Walton’s wooden sheds. However, compared to competitor brands, you’ll find this has a slightly taller height. This is largely due to the apex roof. It offers more central interior head space, as well as helping to give the eaves and the door a taller design too. The main difference between this and other similar sheds is the compact width. You should find it takes up very little space, making it great for even smaller gardens. We always like to see a shed that incorporates the same strength roof and floor as the exterior walls. Both are constructed with 12mm tongue and groove, ensuring a very strong, supportive design. A sand felt covered apex roof offers a brilliant protective barrier against the rain, ensuring it doesn’t build up, even in heavy downpours. It’s a really common roof design and it also gives you the extra benefit of a taller interior space. With extra head room to manoeuvre around, it isn’t just more comfortable; it also offers extra storage benefits, enabling you to store tall tools and ladders. Whilst the tongue and groove roof is definitely a highlight of the shed, it is the floor that really makes the building stand out. We find a lot of sheds tend to make use of solid sheet boards for the floor. This does help to lower the cost, but it doesn’t give much peace of mind if you’re storing heavy tools. With the 12mm tongue and groove timber, you can store practically anything without worrying about whether the floor will support it. Shiplap tongue and groove cladding helps to make this one of the higher-end sheds on the market. Offering super water-resistance and giving the building a long lasting finish, it is considered the best, albeit the most expensive, type of cladding out there. The panels each have a tiny channel built in which filters water away from the building. We also find that this style of cladding offers the most attractive design. It has a much smoother, flawless design that makes it a great addition to any garden. You also have the tongue and groove benefits which not only create an interlocking design, but it also creates an expansion gap. Although this type of cladding is more resistant to warping, extreme changes in heat or moisture can cause it to expand. The expansion gap allows the timber to swell, without compromising the structure of the shed. As it is manufactured with thick cladding, Waltons have made use of a thicker frame to ensure the weight is fully supported. It measures 45mm x 27mm which is a lot thicker than standard framing. It has also been rounded, as well as planed, to stop splinters and ensure just like the exterior, it has a smooth, moisture resistant design. This shed typically requires annual treatments, though it will depend upon the type of treatment you choose. Waltons do supply a free Golden Brown treatment which is a water based fence and shed treatment. It has been resin enriched and comes with numerous great features such as fade resistance and quick drying qualities. Now water treatments are the cheapest option available and obviously if you stick with this free tub from Waltons you won’t have to pay anything for the first year. However, you do need to be aware that they only provide protection for a maximum of one year. They work by forming a tight seal on the surface of the timber, ensuring no water gets through. Although they provide a lot of protection, we often recommend the spirit based treatments due to their enhanced, deep-penetrating qualities. They form not only a surface barrier, but also a barrier within the actual wood itself. This is especially beneficial when you’re treating a lower quality clad building such as overlap. Whilst we do still feel the spirit based treatment would be better in order to ensure maximum peace of mind, as this is created with high quality cladding, you could use the water based treatments and they’ll provide more than enough protection. A 10 year anti-rot warranty comes with the building, though you do need to maintain the annual treatments as part of its terms and conditions. This garden shed comes with one very wide single door. 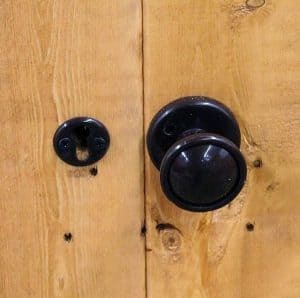 We often tend to favour double doors on outdoor buildings because they obviously provide much more space to access and store things in the shed. However, as this one has an ultra-wide design, we’re impressed by how much space you are given. In fact, we’d even go as far as to say we prefer this large single door over the double door design. This is because it has a much heavier, sturdier look and feel. What we particularly like is its double braced feature. It is one of the strongest doors we’ve come across on this size building and it’s guaranteed not to start sagging over time. No windows feature on this shed so you aren’t going to get any natural lighting or ventilation. However, as it has a compact design this isn’t really an issue. If it was bigger, the lack of natural lighting may be a problem but as a small storage area you shouldn’t notice any issues. 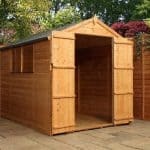 We’ve reviewed a lot of sheds and this is one of the best private and secure buildings we’ve come across. No windows means you can get away with storing valuable equipment without any potential thieves seeing what’s inside. The door is also fitted with a Rim lock which helps to really boost security. Even just the structure of the shed itself has a very sturdy and secure design. 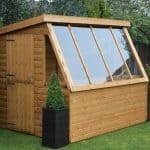 So if security and privacy is very important to you, this is definitely a great garden shed to consider. There isn’t a massive choice of customisation and extra options available and that’s actually a good sign. It means the shed already provides practically everything you need and you don’t have to spend a fortune on upgrades. The only customisation option you have is an upgrade to superior duty roofing felt. Offered in either an olive green or charcoal colour, not only can this felt alter the appearance of the roof, but it can also add more weather protection. Constructed with very solid, thick fibreglass, it acts as an incredible barrier against rainwater and as it is self-adhesive, it couldn’t be easier to install. 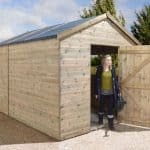 We don’t feel you actually need this upgrade, but it does make sense to make the shed as durable and as weather protected as possible. Onto the extras and the main one we highly recommend is the 7×5 Waltons Portabase. 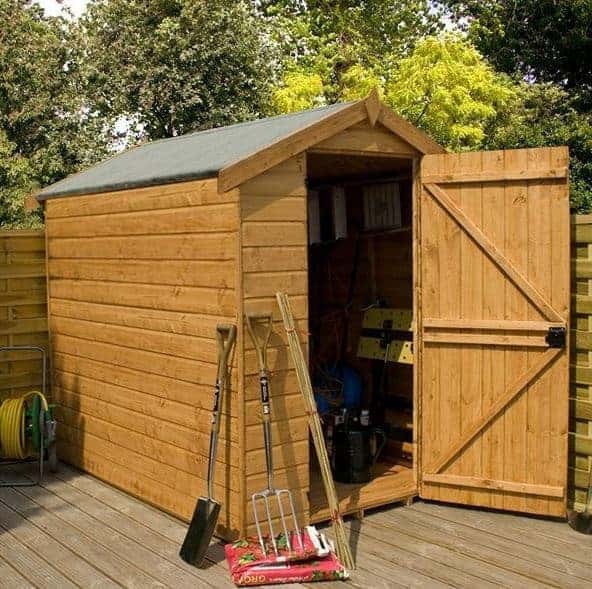 Ensuring you are assembling the shed on a strong base will help to naturally lengthen its lifespan. This is a supreme quality base that lifts the building off the ground and makes it easier to install. 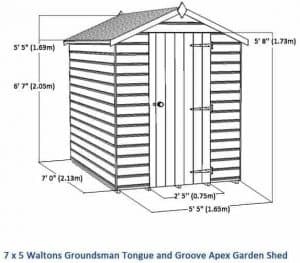 What’s unusual is Waltons provide a free extra strength floor support kit with this shed. It already comes with a strong 12mm tongue and groove floor so we are surprised that the manufacturer feels the need to add this extra strength pack. It certainly isn’t a requirement of the shed, but as it’s free who are we to question it? The support kit adds an extra 30mm thickness to the floor so you are left with an outstandingly tough level of support. As this is part of the Premier Groundsman range, it comes with a fantastic quality design. The fact tongue and groove cladding has been used for the roof and the floor also highlights its level of quality compared to the solid sheet floor varieties out there. 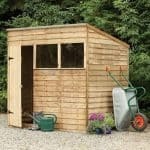 The included 10 year warranty against rot gives you some idea of the longevity of this shed. However, it does need to be annually treated in order to get the most from its long lasting design. This may not be the largest storage shed available, but it does offer a surprising amount of space. You have the floor space, which is deceptively spacious, as well as the ability to hang tools from the walls and install shelves. This is one of the easiest sheds to assemble in the Waltons range, though parts of it are pretty heavy. You will also find it does take quite a few hours to put together. 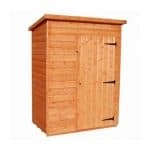 You will struggle to find a similar shed that offers such excellent value for money. The complete tongue and groove construction and weather resistant features help to add great longevity to the building, whilst a free tub of treatment also saves you money. Final Thoughts: To look at this building, it comes across as a pretty basic shed. However, when you look into its specifications and features you soon realise it is head and shoulders above much of the competition. The highlight is definitely the tongue and groove cladding featured throughout the entire building. This just shows the type of quality it benefits from. While there is a good choice of extras, we like that you don’t really need them. So you have the potential to save a lot of money in comparison to other, lower quality sheds. Its windowless feature also ensures you have ultimate privacy.